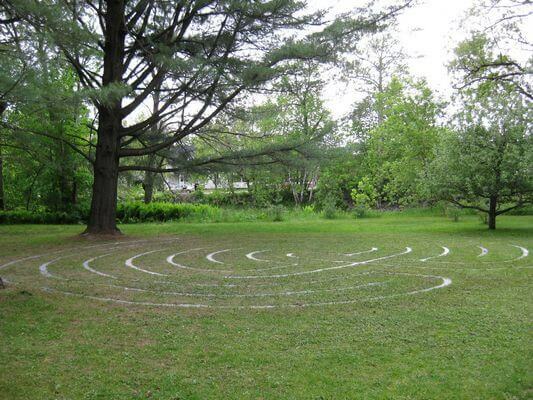 We have a Labyrinth on campus which is located close to the chapel, down the hill from Divinity house near the river. Just walk towards the metal sculptures in the trees and you will see the plaque which marks the entrance. The inspiration of Regine Neumann, Carol Dignam and Heather Thomson, it was constructed with the help of a team of volunteers from the Bishops community. Construction took place in the spring of 2009 using local granite and stone donated by Les Entreprises Alain Préfontaine & Granit C. Rouleau Inc.
Labyrinths have been around for over 4000 years and are found in just about every major religious tradition in the world. They have been an integral part of many cultures such as Native American, Greek, Celtic and Mayan. Like Stonehenge and the pyramids, they are sacred geometric forms. While there are three basic designs – seven, eleven, and twelve circuit – the most common design found today is the seven circuit. Ours is a seven circuit Cretan labyrinth. Many people make the mistake of thinking a labyrinth and a maze are the same. A maze has dead ends and many trick turns. A labyrinth has only one path leading to the center, and back out again. This path symbolically represents the journey to the centre of self. The labyrinth is typically used for: reducing stress and anxiety, calming and clearing the mind, tension release, increasing inner awareness, expanding and shifting consciousness, gaining insights and spiritual contemplation. The experience can range from very profound, to just a pleasant walk. Walking the labyrinth is simple; beginning at the entrance where the plaque is, just follow the unicursal path slowly and mindfully to the centre, and then back out again. Stay present to your own unique experience. You may set an intention at the beginning, such as posing a question or concern, or just stay open to whatever arises. You may pause at the centre taking time to contemplate your experience, or just continue your journey out. How one walks and what one receives differs with each walk. Each time is a new experience!